It happened this year!! After having to miss out on my most convenient and least stressful face of the year last year…this year I was registered and ready to run. That’s right, my friends. It was time for New Albany’s very own Fast Freddie Five Mile Foot Feast. It is held every Thanksgiving morning (for 28 years now!) and it happens…literally…right outside my door. The start and finish area is at the fairgrounds located directly across the street from my apartment complex. How’s that for an easy race morning? As you might recall, last year I was still on the recovery list after dealing with my nemesis, my hip labrum tear, and then…my stress fracture in my leg. The hip is going to be a constant thing, but when my leg started to bother me again, my orthopedic doctor decided it would be best to take the rest of November off from running and to send me to physical therapy. I had been registered for the Fast Freddie Five Miler already…because I knew my boot would be off and I figured I’d be good to go. But, sadly, I wasn’t. And for the first time in the years I have been running…I had to miss out on the challenging race before my Thanksgiving feast. I was, however, a brief spectator last year, rushing down to the start line in just enough time to see everyone off. And this year…in the true tradition of Thanksgiving…I was hungry for this one. When you think your coach is on drugs for the pace she wants you to try to hit…and then this is the bib number you are assigned! The Sunday prior to Thursday, I met up with my friend Jack and his friend Heather (who recognized me from the YMCA) to run the course. It was 23 degrees out that morning, but I hadn’t run the course in a long time (and I know I need to because it does have some hills to challenge me), so I really wanted to do this test run on the course. Or…a course preview…as we referred to it. I ran it at an easy pace…my Garmin saying I did it in about 39 minutes. Happy with that. After getting home, I went to check my training calendar that my coach, Linda, throws together for me each week. Fast Freddie was listed…and she set my goal time for 38 minutes. I had run just slightly over 38 minutes when I ran this last, in 2014, so I thought this was an achievable goal time for my first year back to this event. 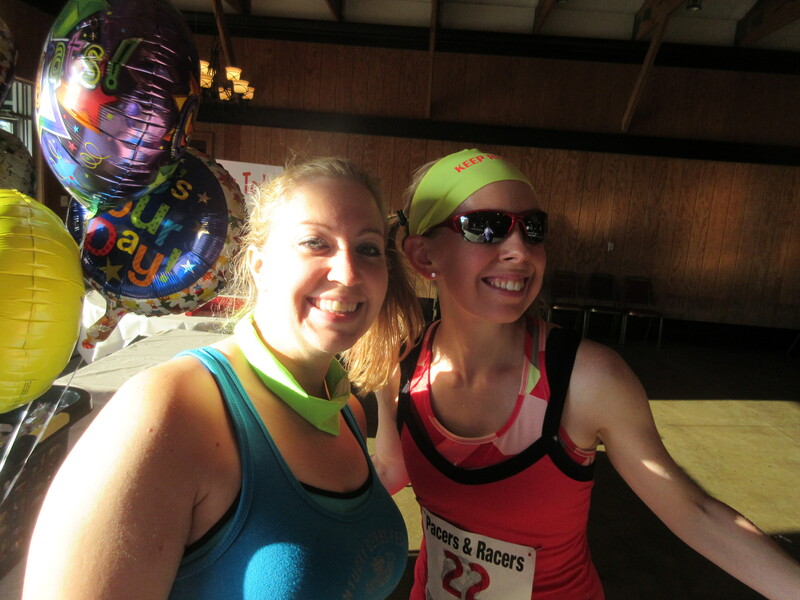 But, later that night, she texted me and said that she changed my time goal for the race. I went to check and she changed it to 36 minutes. I texted her back and said that I had never run this course that fast (my fastest race time is 36:54 in 2013…when I was in my best racing shape), but I would try. She told me not to kill myself doing it, but she thought I was capable, being that I was just barely over 36 minutes on a 5 mile speed work run I did a few weeks before. For the rest of the week, I fretted over that race time. 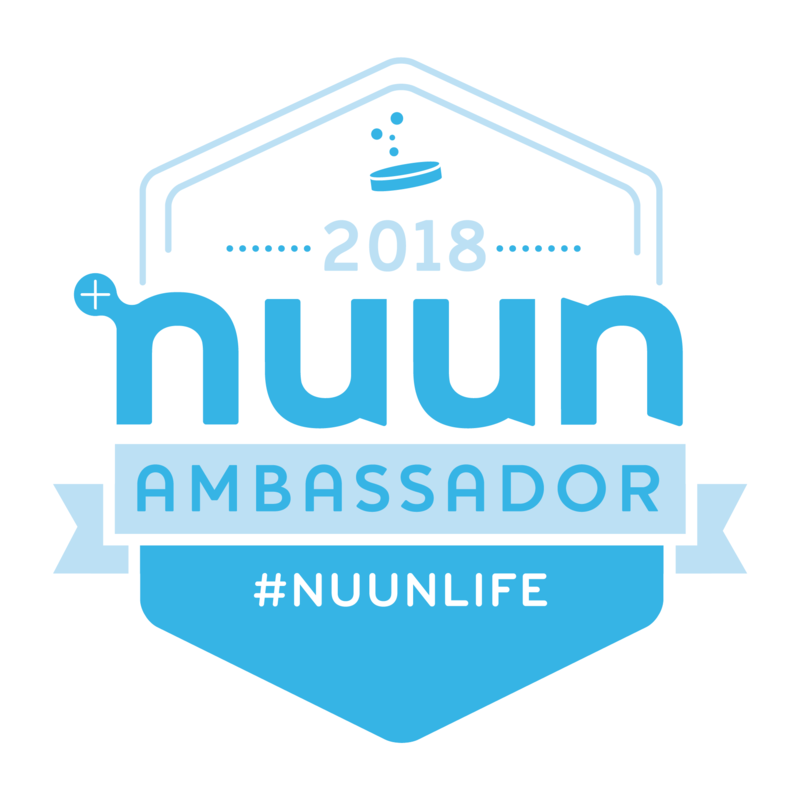 I did my training runs, hit the paces, tried to run easy on the easy days (which isn’t easy for me…unless I run with other people), and just not try to obsess over it. I would do my best on race morning…and that’s all I could do. Me after 4 hours of cooking and baking on Wednesday night. To top it all off, though, I was hosting Thanksgiving this year. I hosted last year, but I wasn’t racing, so I decided that I needed to do as much as humanly possible the night before. This meant, I made a conscious decision to not rest my legs or feet…but to stand in the kitchen and cook up all of the side dishes I was serving. Leaving, simply, the sweet potato fries, the BBQ pulled turkey, and the apple cinnamon slow-cooker apples for the morning. It took almost 4 hours to get it all done, but I did. I even had to set an alarm on my phone to wake me up so that I could put the food that was cooling on racks into the fridge. I went back to bed, having my alarm set for to give me time to do all my stretches and PT exercises before the race…as well as chop up a lot of apples for both the slow cooker that had the turkey and the slow cooker with the apples as well. It was a hectic morning, but I managed to get everything going before Cathy taped up my right foot (still having some issues with it) and pinned me up. Time to go. 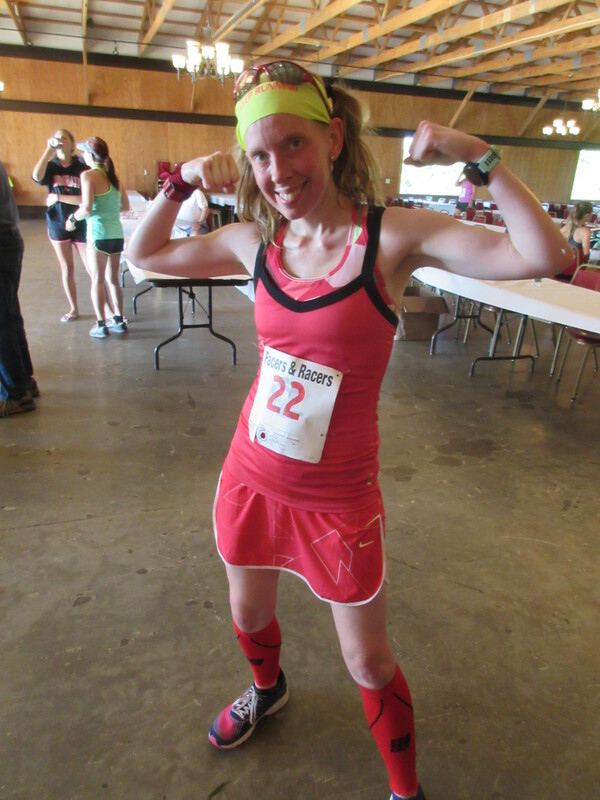 So…race morning was the type of weather where I get really confused as to how to properly dress. It was around 50 degrees at the start, but there was a cold 9 mph wind. According to the Weather Channel, it felt more like 46 degrees out. 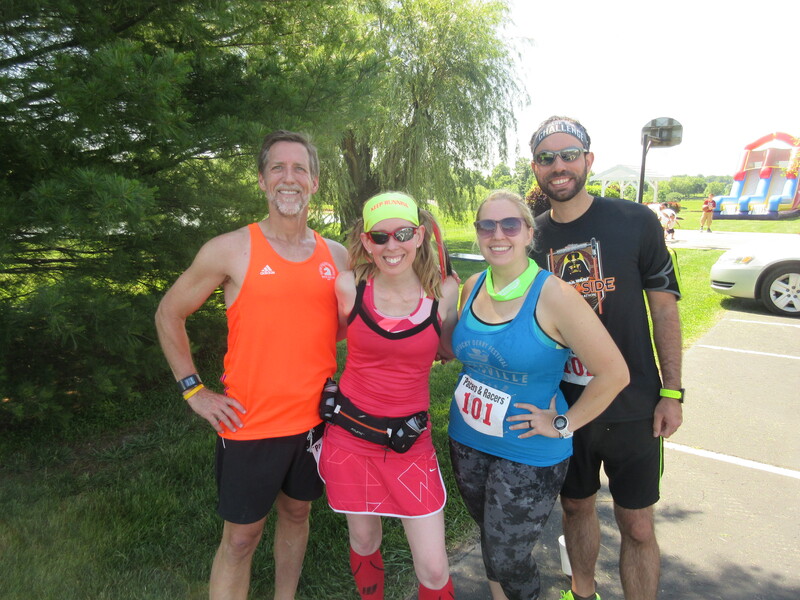 That being said, I had opted for a t-shirt and a pair of short (rainbow) shorts…and my usual compression sleeves and BondiBand with pigtails and all that good stuff. Melissa and Jack were in leggings and long sleeves. Leah was in shorts and a t-shirt too (and was wearing a pie hat on her head). Leah, Me, Jack & Melissa…the #KDFMarathon Ambassadors representing! We gathered outside for the photo…my peeps wearing their KDF Ambassador shirts (I like to be bright, so I didn’t wear mine…but I did hold it up!). Not going to lie…it was cold. So, after the photo, Jack and my warm friends helped walk me to the start line while keeping me warm. And it was here that I ran into my friend, Harry, who was walking the course. So…I was just finding everyone today. Fast Freddie’s Five Mile Foot Feast starts promptly at 9 am. Fred came out to give the usual information about the start. He would tell have runners get ready and then blow the whistle. And that…is what he did. And at the whistle blow…we were off. I saw Cathy immediately, holding up my sign, gave a wave, and pushed on. After all, I was chasing down a fast time. Fast times used to be a lot easier for me. Especially when a course has hills. You see, one problem I am finding with my hip labrum tear is that I lose power and speed on my uphills. I can’t easily burst up them like I used to. Nope. I actually struggle at times on hills. But I wasn’t going to worry about that. I didn’t have time. You pretty much get hit with a hill right away on this race. Not a big one, but it send you up and over the highway…but there is a nice downhill that awaits on the other side. I revel in those downhills. What I lack in hill climbing, I made up for on those downhills. Up ahead was the light, and we all blazed our path onto Mt. Tabor road, hitting that first mile marker. I looked to be just slightly behind on the 7:12 pace I would need to average in order to hit 36 minutes. Mt. Tabor Road is a series of rolling ups and downs. By now, the body is warmed up and I can take these in stride, for sure. I actually handled these better than I anticipated. I was pushing that pace, hoping to, maybe, surprise myself in the end. We crossed the railroad tracks, went up another hill and then down, turning onto Grant Line Road. Mile 2…done. And I was still just a smidge under the 7:12 time. But this third mile…this is the killer. As you head into Sam Peden Community Park, we get hammered with our first long climb. This hill isn’t steep…but it is continuous. Pretty much for the entire half a mile that you run toward that third mile mark. There is a water stop as you enter the park, but I always bypass it and keep running. My focus at this point was on pushing myself up that hill. 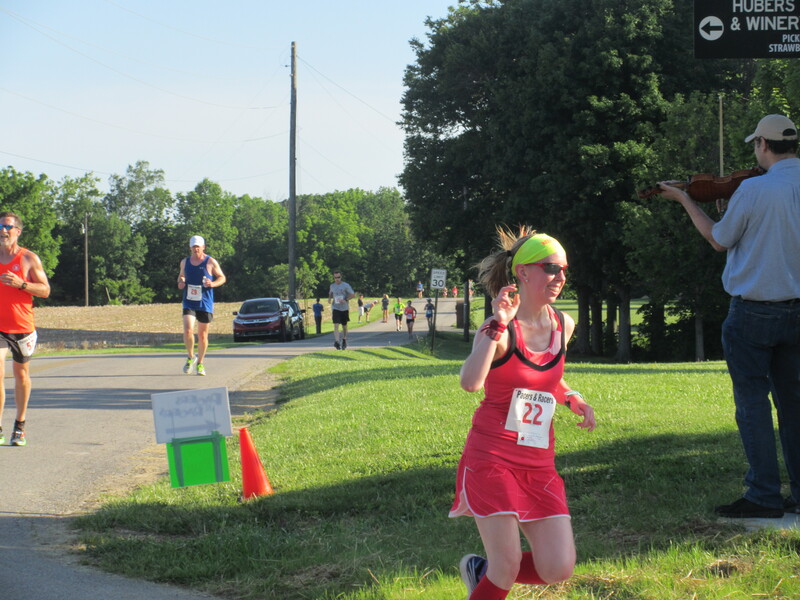 This was not easy for me…and I could feel myself really fall back on my pace. And when this hill does level off (nope…no downhill…darn it), you’ve gotten through that third mile. I was set back now on my time, but I was going to see if I could make it up. I rounded the corner and started to make my way out of the park. There was a guy near the apartment complex at the park exit cheering on people. He saw my number and said, “What you got for me, 420?” HA! Honestly, I used to dread Schell Lane. It is the hilliest part of the race. But, this past summer as I was training for the Kauai Marathon, I made a point to do hill runs in the mornings up Daisy Lane (opposite the way we run it in this race) and then through Schell Lane and back…just so I was getting in various climbs on the hills. They slowed me down slightly, but the downhills gave me some momentum to make up some time. The last hill is the hardest, but you get rewarded with the best downhill ever…all the way down Daisy Lane. I made the turn, and pushed my pace on that downhill hoping to catch some of my time. This is my favorite part of this race. I feel so fast and free and alive. Four miles…done. 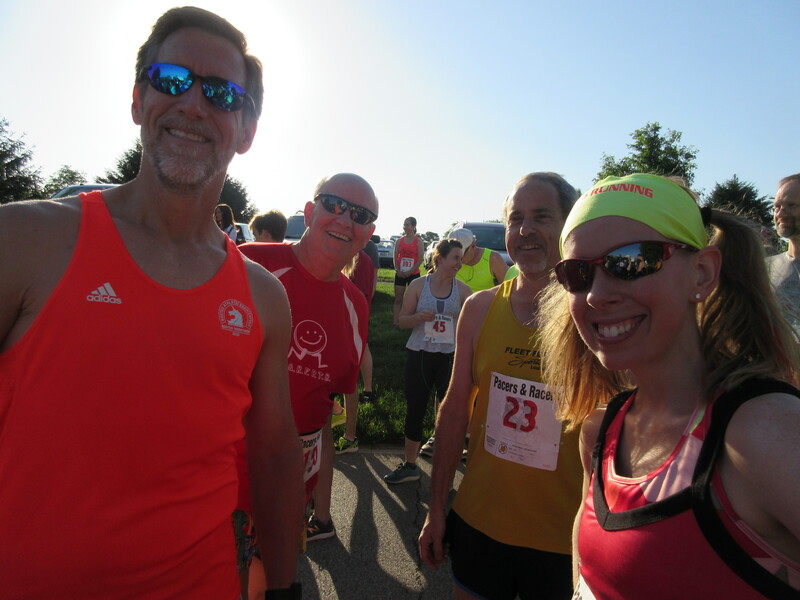 The last mile was all that I had left…but I was starting to run out of gas in my legs. Seriously. Daisy Lane levels out pretty fast and it’s a huge shift when you’re coming down that hill to suddenly just have…flat. I proceeded as fast as I could force these legs to move, but I knew I was starting to struggle. I also knew that I was close to having a time in the 36 minute zone…so maybe…maybe I could at least get a new PR. I made it my goal to, as always, do my best to make this last mile count. …and managed no new PR…and missed 36 minutes by well over a minute. But I was done. I had beat my 2014 time by well over a minute, so given that last year I wasn’t able to run at all…this was a total and complete win. I think, as I train more this coming year, I’ll find my stride again. My running has been a struggle as of late, but I’m getting it figured out, little by little. After crossing the finish line, I went and met up with Cathy and we went to find a spot near the road to cheer on the rest of my #KDF Ambassador team!! Jack came in first…then Leah…and then Melissa and Paul. I was there for all of them. And, afterwards, we even got a picture with Santa, who was at the finish. You never know what to expect from this race. The awards were going to be handed out and the raffle drawings were going to be done, so we headed into Newlin Hall, where it was warm, and we all just sort of conversed as prizes were handed out. And then…as they got to the Female 35-29 age division…I heard my friend Amber Korte get announced as third…I hadn’t even seen Amber. I wasn’t sure if she was still there, but I cheered loudly. And the second place was announced. 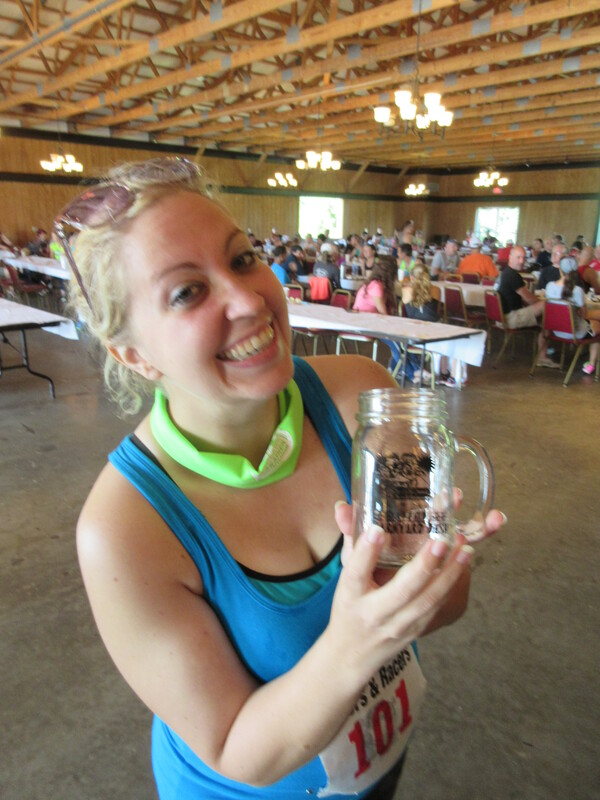 And then…my name was called for first in my age division. I was…amazed, to be honest. In 2013, when I ran my fastest time on this course, I didn’t even place. When I ran in 2014, I was third in my age division. So, yeah, I was surprised. I went over to the table and got my Fast Freddie Mug (they were yellow this year! )…and went back to hang with my friends. Except…I had some more stuff that needed to be done for Thanksgiving dinner…so we hugged and I said goodbye and headed back home to shower and cook up the remainder of the meal before everyone started arriving. The infamous Fast Freddie Five Mile Foot Feast mug as age division awards. LOVE IT! First in my age group this year! The official results of this year’s Fast Freddie Festive Five Mile Foot Feast was that I finished with an official time of 37:03…only 9 seconds off my PR on this course, and a full minute and three seconds slower than my coach was hoping for. I was 112/866 finishers this year. I was the 21st female to cross the finish line. And I was 1st in my age division. 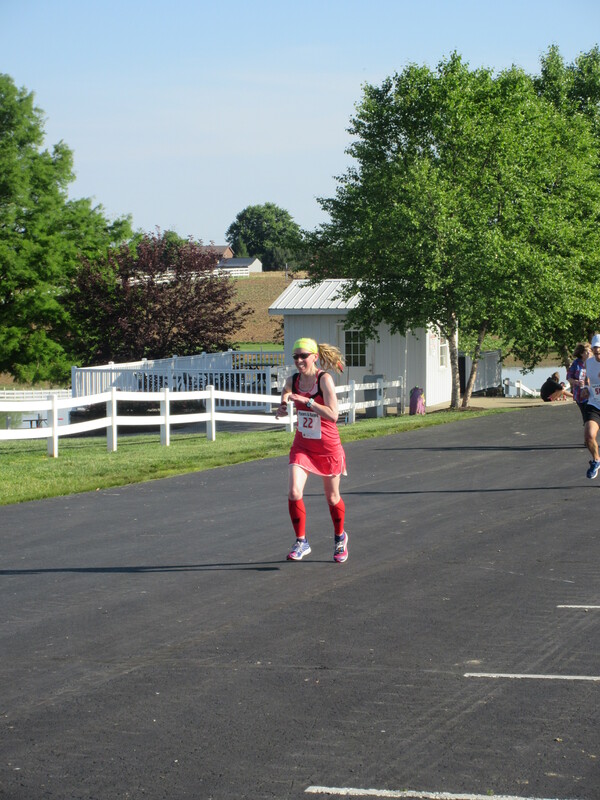 I was disappointed that I didn’t manage the fast time Linda hoped I could run, but I ran really well and really hard…and I still ran better than the last time I ran this race. I’ll take any small victory at this point. Maybe, with a little practice, and some hip strengthening, I’ll hit that sub-36. Whatever feeds your desire, your hunger, and your fire…chase it down this year.